... and a red Fiat Turbo stops, tires a-screeching! This is going to be a very different text. Virtually everything about it went in a completely different fashion, to paraphrase Monty Python. Even the title is different - "Hitchin' A Ride" is a lovely pop song from 1969 by a British group called Vanity Fair, and we all know who drives a red Fiat Turbo - all but the police, that is, they are still enquiring. But enough dallying, let's dance. Mr Graham Slee is no novice to TNT readers - Geoff Husband did a test of his standalone phono stage. Mr Slee lives in Britain, has an engineering background in both pro and home audio (and with a well known firm, too), but now devotes his time and talents manufacturing add-ons and selling them via Internet. This of course necessitated his sending me the product under review. Why would he do that, you wonder, when Geoff is so much nearer? Well, the answer is simple - this is an outboard headphones amplifier, and I happen to be the headphones freak on duty here. I have a small collection of them and love them dearly. And I'm an old hand at outboards (Mimmo, take note!) - I've had a British Seagull since 1968, which never ever broke down, or refused to start up (nor will it ever, I think). I think I even changed the sparkplug once. During our initial correspondence, Mr Slee sent me photos of this products, which you can see on his site; well, upon unpacking the carton, I was greeted with a product which looks MUCH better than on the photos, and I would suggest Mr Slee makes some better shots. In effect, you will receive two boxes. One is a dedicated power supply, and the other is Solo itself. This is a very logical division. The power supply should be as far away as possible, so as to reduce any possible influence; not that there's much of it, I used my Swedish made electro-magnetic sensor/meter to check out on interference and got a ridiculous reading. The power supply is good for 230V, 50/60 Hz, but I assume Mr Slee can cater for different voltages as required. Anyway, my nominal voltage is 220V, but I actually have 222-224V, so I was near enough. Both leads, the socket and output, are captive; as it turned out, I could have used another meter of wire on either side, but I must also add my room is a very difficult one to please, as I know only too well. The amp itself is a rather nice looking plastic box - well, I like it, I've always been a fan of piano black finish, and this box approximates just that. On the front, you'll find the 6.3 mm headphone jack, a discrete volume pot knob and an on/off rocker switch. On the back, you'll find four RCA jacks like you'd never expect to find on an add-on box of this price and purpose - big, gold plated and Teflon insulated. I only wish the audio industry as a whole used such jacks. Why four? Well, two are input and two are output (pass through). In real life, whatever else may or may not be available, but one set of output jacks is available on the vast majority of products, usually dubbed tape feed. If you plug in the Solo, you loose your recording line outputs - unless you have the pass through capability installed. So you can plug the Solo to the tape feed, and use the second set to still connect your recording machine, losing nothing. 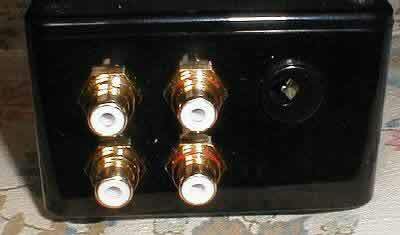 You will also receive a set of four Y RCA jacks. These have one male plug on one side, and on the other, there are two female outputs, at right angle. This means still more expansion capability, and although electrically this may not be the best of solutions, it is good thinking on Mr Slee's part, and it does cover a lot of your bases. Finally, you'll find two RCA plugged stereo cables in the package; these are of typical commercial junk quality, and are obviously included simply to get you going straight off and to buy you time to obtain some decent cables of your own choice. Inside, you'll find some orderly electronics, the audio job being done by an Analog Devices AD826 op amp, subsequently supported by complementary bipolar transistor pairs. This is a very fast (350 V/uS) dual op amp, but much more important, to the best of my knowledge, there is no other op amp with such an incredibly short settling time (just 70 nS to 0.01% - there's an extra zero here, mind, meaning an extra order of magnitude, since most are given as settling time to 0.1%). With such a slew rate, which depends on bandwidth, let's say that bandwidth and frequency linearity 20...20,000 Hz are simply not an issue (full power bandwidth is 9 MHZ). Resistors are 1% metal film, capacitors are mostly by Wima, and from their well respected audio series. Testing a unit like this is actually complex work. First, I have to listen to it on its own, to see what are its absolute performance limits. Next, I have to compare it to standard output jacks as provided by various manufacturers, in my case Harman/Kardon and Yamaha, but also Philips, H/K and Yamaha on their CD players. Then, I have to check out various cables, and lastly, I have to do all that with several headphones, to see if there's any variance between electrical parameters. But luck was with me, as I was just wrapping up the review of Karan Acoustics KA-i180, as the Mk.2 of the integrated tested on TNT is officially called. This one has no headphone sockets, just one set of line outputs - a perfect candidate in all respects for the target group of this product. I consider this good as it gave me one almost perfect source to play with, and a very real one - why would you even consider an outboard headphone amp if your pre/integrated/receiver already has a phones jack? Actually, you might, indeed should, still consider it. Most headphone jacks on most integrated and power amp units provide the signal via a voltage divider. This consists of a resistor in series and a shunt resistor (to the ground), or simply a series resistor; this will most definitely work, and has worked for the last 50 years or so, but has the inherent disadvantage of that series resistor, which in fact defines the output impedance, and hence the damping factor. A very typical situation is this - your headphones have a nominal impedance of 32 Ohms, while the output impedance from the phones feed is 220 Ohms. So you have a wonderful damping factor of (32:220) 0.15! In other words, you don't have a damping factor. But a dedicated headphones amp will show a decent damping factor, certainly much greater than the usual, and this should show up in listening tests as better definition and control, not to mention ambience. Another point well worth considering is what happens when you use those Y connections - will the signal be reduced, will your recorder still have enough signal to work with? So I did what I think will be the most usual situation - I put the Y jacks into the Karan's tape outputs, one set of cables to the Solo, the other to my Sony TC-K808 ES cassette deck. I've had it for seven years now, and know it well. Briefly, nothing changed; with CD as source, full modulation still occurred at approximately 1 o'clock, as it always does, with or without the Solo. Exactly the same happened with all my three resident integrated amps (Yamaha AX592, H/K 6550 and H/K 680). The obvious conclusion is that with the Solo, you loose little, if anything, by way of signal voltage. The obvious starting point is to use the package as is. So I connected the Solo using supplied components, to KA-i180's output jacks, turned its volume down and turned the Solo's volume up. With Grado SR60 phones, I was greeted with bags of detail and what I really loved, a sound stage with no seams even implied top to bottom. This is much helped by the overall sound of the Grados, which are probably the best phones you can lay your hands on without having to mortgage the house again. They are, in short, what phones are all about - but as any good component, they can be seriously degraded by upstream electronics, the amp, the CD player, and of course, the cables. A quick switch to MIT Terminator 4 cables confirmed this - more details were available, but a little on the colder side of things. Van den Hul's 102 Mk.3 cable set things right, and I spent the next several hours sort of lost in music (I do that, it took me years to convince my wife I'm not using psychotropic drugs, or watching CNN). However, while providing a wonderful tonal picture, the Grados lack that final bass oomph, and here's where the Sony MDR-CD480 phones kick in. They have oodles of bass, almost as good as Koss SR/80, but being close backed, this wonderful bass tends to be excessive and drown out a bit of the rest. What I wanted from them I got, they told me the Solo doesn't lack anything in the bass department. This little exercise also clearly showed the need for some decent cabling - not that it was any news. Switching to Sony phones also demonstrated the effects of the damping factor. It's well documented that I pay special attention to the bass department (well, what do you expect of one who banged drums in his wild youth? ), which is also very, that's VERY hard to get right anywhere, and especially so on headphones. Once you do get it, on typical headphone feed lines your damping factor will not be there, and this will produce loud, but poorly defined bass, which in my view is much worse than lack of bass. I prefer quality to quantity, so less well defined is much preferable to plenty of poorly defined, slurred, muddy and uncontrolled bass, which is what I get far too often for my taste. Sennheiser phones are a good example - very neat, very tidy, what they have they have it good, what they don't have, they don't try to imitate. No wonder the Sennheiser 540s went well with the Solo. For the boom-boom freaks, nobody does bass like Koss, so it was, so it still is. Harman/Kardon HK6550. This is a single ended push-pull design, and is pretty good in the details department. Output series resistor is 220 Ohms, so damping factor is zilch. Still, the 6550 did pretty well, especially in the detail department, but overall was still outclassed by the Solo. Harman/Kardon HK 680. This design has lots of power, but uses a 470 Ohms resistor. Essentially, due to internal differences, it did about as well as the 6550, and was also outclassed by the Solo. Yamaha AX-592. This has a series 680 Ohm resistor, a pity, since it also has an excellent damping factor, which obviously is of no consequence due to the resistor. The sound was not much really, I wouldn't want to have to listen to it for a long time. Solo much more preferable. The three CD players. Since all three have the same basic arrangement, a dual op amp driving the phones, all three sound much the same, and that means like not much at all. Small wonder, two of three use the same op amp, and the third is similar but from a different source. Solo wiped the floor with them. As a solo performer, the Solo brings much of the available sound quality on software to one using headphones. Notable are the frequency extremes, both bass and treble in equal measure - they have that quality which is simply not possible from standard series resistor arrangements. The bass is deep, but its main virtue is its cleanliness, its lack of overhang and its good definition. I admit to being a little surprised here, since the Solo is capacitor coupled, and such designs all too often lack bass drive and energy, but not so here, I suspect due to very high quality Wima caps used (most throw in any old cap they happen to have a wagonload of, or can obtain cheaply). The treble, on the other hand, is very smooth and easy on the ear, giving away nothing, not the definition, not the ambience, not the warmth, nothing! There's no splash as such, and on the few occasions I did encounter it, it was the CD's fault, not Solo's. There's no false sheen, and instruments sound the way they are supposed to sound, as they sound in real life (through the Karan, at least). To add insult to injury, the Solo makes positive fools of integrateds with headphones outputs when the signal is taken from their own tape outputs; I would suggest to all these manufacturers to try it out, perhaps that might help them produce better headphone amps in the future. 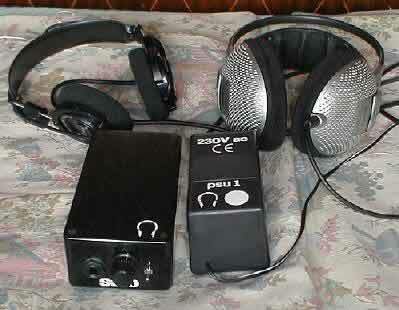 The Solo is indeed an audiophile's product. Cost have been cut, as evidenced by plastic cases, but the money went to where it counts most - its sound. The case may be plastic, but the connection jacks are those you expect of units costing well into four figures (for Italian readers, into eight figure numbers), the printed circuit board is of very good quality both in design and finish, and the concept of two separate cases is top notch. The materials used are by and large of excellent quality, full audiophile grade. On the down side, the main case is plastic, and I won't deny the fact that I would have been happier with a metal case. The volume pot is a commercial quality unit, and I would have preferred an Alps, Noble or TDK pot, but I realize that would have increased the cost by about 25% all by itself. Mr Slee tells me he's working on a de luxe version, which will cover both above bases, and then add some; assuming that is right, then we have here a product which will satisfy audiophiles on a budget, and while not exactly cheap, I honestly cannot say the Solo is expensive either, even in absolute, let alone relative terms. The rest must wait for the de luxe version. In relative terms, its price/performance ratio is nothing short of excellent. 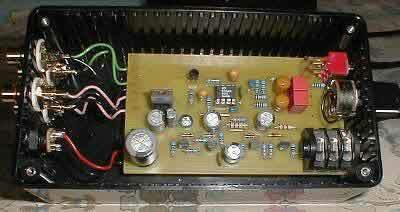 Its design and sound show first rate understanding of what is required of such a unit. In my view, the Solo goes an unusually long way towards the ideal for what is ultimately a very reasonable price; in other words, its price/performance ratio is excellent, a very rare sight indeed these days. No mass manufacturer could ever make such a unit; they need quick and dirty, and this one I think took its time in developing and elaborating. As ever, there is a "but"; you could find yourself disappointed. Just make sure the object of disappointment is well chosen, because it will not be the Solo which is to be blamed, but the phones. The Solo is very neutral, but alive and kicking, so if something's wrong, chances are it's the phones. In my case, Grado, Sony, Koss and Sennheiser all produced distinctly different sounds, which were along generally known lines, but raised to new levels of both quality and differences. This in itself is a plus for the Solo, but is also a warning to potential buyers - make sure you give Solo the room it needs, in form of good quality cable and headphones, then sit back and enjoy the ride. Get it right, and your speakers will be in trouble - they will have to compete with your phones, and you will KNOW why designers like James Bongiorno and Dan D'Agostino test their products with phones rather then speakers. The Solo could be the reason for you to buy good phones at last - and it's portable enough to be taken to the shop and used for actual auditioning. It deserves to succeed, this one, it has all the makings of a best seller. But it is also a challenge to its creator, Mr Graham Slee - the hardest thing for any designer is to better his own best seller. While he's sweating away, I'm off to hit some serious notes with the Solo. Mr Slee in fact offers this package in dual form, as the Solo all by itself, but also as the Solo with a pair of Grado SR60 headphones included. This second package costs UKP 229 (Euro 373), or the exact retail price of the headphones added. If you don't already have a set of cans (as headphones are affectionately called), I would urge you to strongly consider this option. Take it from a headphones freak, at that price, to the best of my knowledge, nothing comes close to the Grados for overall balance and definition. I've always thought them to be good, but it was the Solo which showed just how good they can be, given proper drive and damping factor. Of course, this was true for all my headphones, but I do believe none profited as much as the Grados, and this speaks well of them. My usual headphones subject ending comment here - for ultimate sound on the planet, which no loudspeaker can ever hope to match, Stax rulez! Nothing comes close to those, not even Stax' own electrostatic speakers - but at a premium price. I am pleased, as any manufacturer is, that my product has earned a positive review. It seems I'm on the right track with it, because TNT's findings are essentially what I set out to do. What particularly pleases me is that the Solo was found to offer a good price/performance ratio, since I spent much time developing it with just that aspect in mind. A challenge, if you like - good sound cannot be dirt cheap, but should not be priced astronomically either. For all that, I am well aware that still better sound can be provided. To that effect, I am currently developing another, more upmarket model, one I see targeted at the connoisseur, but at a necessarily higher price level. As soon as it is finished, it will be submitted to TNT for testing, in hope it fares better yet than the Solo.